After the approval, the company can commence its operations as ROH. For ROH that does not have promotion investment privileges, the ROH must apply for i) work permit at the One Stop Service Center for Visa and Work Permit and ii) apply for visa at the Immigration Bureau. Foreign associated enterprises must have actual business operations including i) management staff and ii) employees. In the case of force majeure, the Director-General of the Revenue Department may lower the income threshold for one accounting period, subject to approval. Net profits and interest received from ROH’s foreign subsidiaries for loans granted, if the loans are from third-party sources. Dividends paid out of the ROH’s qualified income to foreign shareholders not conducting business in Thailand. Accelerated depreciation rate of 25% for buildings on the date of acquisition. The residual value can be depreciated within 20 years. 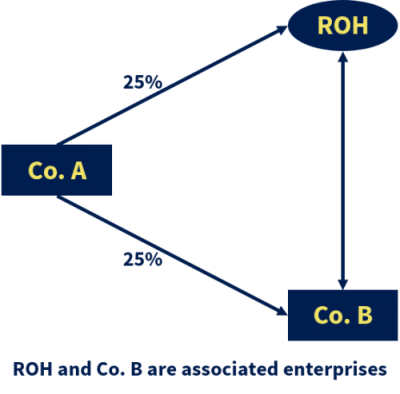 The company holds at least 25% of ROH and other company’s issued capital. In this case, ROH and the other company are both regarded as associated enterprises. The associated enterprise has control over the ROH and other company, where both the ROH and the other company are regarded as associated enterprises. 2nd return – for income that is subject to normal tax rate of 30% or special rates granted by BOI. The income is not part of the ROH nor its associated enterprise’s expenses in Thailand.